A weird mix of poetry, essay, self-help, and manifesto for the future, adrienne maree brown’s 2017 book can be found in the “cultural commentary” section of the bookstore. But it doesn’t fit comfortably into that category, and in fact, it doesn’t fit into any one category at all. I see it as a business book, a parenting guide, a writing inspiration, or a self-help manual. It just won’t sit still in any one category. And that’s why I love it so much! Brown is a Detroit-based activist, healer, thinker, and writer. Her book is something truly original. She writes it the way she knows it to be true. She trusts that the right organisms will hear her strange call. She knows her words will make perfect sense to the exact people she wants to talk to. Originality is a hard-to-find quality in today’s cluttered landscape of business books. But this book has it in spades. It’s inspired partly by the work of Octavia Butler, an African-American woman who wrote science fiction at a time when the genre was dominated by white men. And how, exactly, can science fictional stories inspire a book of cultural commentary? That’s what I was asking myself when I first picked up a copy of brown’s book. She proposed a satisfying response to my inner questioning on page four of her introduction. Okay, I said, and bought the book. You should read this book too, just to repair the fact that you don’t already know about Octavia Butler, and her importance as a thinker and person. She was previously in the margins and can now be placed at the centre. Because let’s be honest. There’s a vacuum at the centre. The world needs new ways of thinking about leaders, leadership and change. And brown’s book proposes what I see as a viable alternative to the current world order. You should read it because it will help you imagine a more positive future for yourself and your kids and their kids and their kids. You should also read it just so you can hear in all its fullness adrienne maree brown’s voice. Somehow, the author manages to blend an entrepreneurial mindset with witchcraft words, and her vibe perfectly echoes the kind of feminism I see in my own world. For example, there’s a chapter of “spells and practices for emergent strategy.” It contains brown’s thoughts on meditation, an authenticity chant, a spell to stop hate, her notes on finding an intimate community on social media, and a shout out to Drake, the Canadian rapper. I feel as if she’s speaking directly to me and my friends. This book is on Rebecca Solnit’s nightstand. And it was the book all the entrepreneurs were talking about at the Entrepreneurial Feminist Forum, which I attended earlier this fall. The conference was an ideas and networking highlight of the season for me, and I thought it was pretty incredible that this book kept coming up in conversation. It’s not like adrienne maree brown is a huge name, and this book isn’t at the top of the best-seller lists. It was exciting to experience the knowledge and generosity of a conference full of 200-ish feminist entrepreneurs. I could feel a prickle in my skin when I heard these women talking to each other. And when we took breaks between sessions, the image of swallows kept arising spontaneously in conversations. Then someone would mention Emergent Strategy, and everyone would nod. It seemed to me everyone at this conference had recently been reading adriennemaree brown. I thought, this book of social justice activism / poetic essays is a must-read among feminist entrepreneurs … well, that’s curious. What do swallows have to do with it? In her book, brown describes an alternative vision for change that comes from small collective actions, rather than orders from a leader to their followers. Like swallows in the sky or dandelion seeds on the wind, change can come from a set of consistent actions that form an unintended pattern. These actions can emerge despite benevolent strategic plans made by the leader of a hierarchy and enacted by an organization. Birds don’t make a plan to migrate, raising resources to fund their way, packing for scarce times, mapping out their pit stops. They feel a call in their bodies that they must go, and they follow it, responding to each other, each bringing their adaptations. The patterns that create change in nature can also function in human ecosystems, brown argues, and they may just be more powerful than the hierarchies we’ve invented and propped up with a patriarchy. 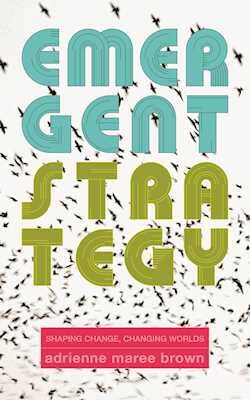 My takeaway from Emergent Strategy is that it’s possible to be a leader who doesn’t dictate a vision, but rather listens and responds to what is emerging. Especially if you don’t think of yourself as a leader, brown’s alternative vision for what it means to be a leader is the real reason you should read this book. Because the world needs you to step up. Like this review? For more reading inspiration and reading recommendations, sign up for my 52 Books Newsletter. My blog 12 Books is an evolution of a book review project I did in 2018 called 52 Books. I wanted to read more and write more, so I set the goal of reading and reviewing a book a week. I couldn’t keep up with the grueling schedule, but the project had the intended effect anyway. I am happier and calmer and more focused on what matters to me. In 2019, I’ll slow down and read and review a book each month. To reflect that, I’ve renamed my blog 12 Books. I’ll write reviews of non-fiction books about personal finance, wealth mindset, leadership, careers, digital transformation and more. I write a monthly newsletter about what I’m reading — online and in print. Follow along to make 2019 a year of less Netflix.